While it’s fairly simple to create a Google Analytics account, there’s still room for confusion. Taking the time to learn key terms beforehand, like accounts and properties, will ensure that you are setting your account up properly. Errors in the signup process can become very evident as you start implementing more advanced analytics techniques. 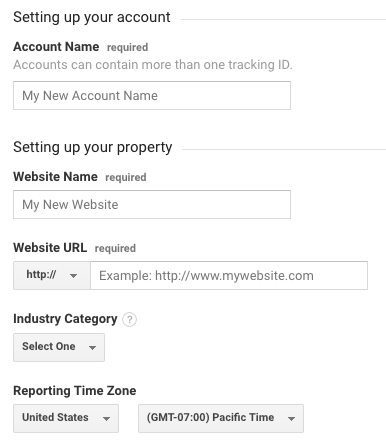 To save you some trouble in the long run, we created this beginner-friendly, step-by-step guide to help you create your first Google Analytics account. Happy analyzing everyone! Before getting started, it’s important to know the difference between an account and a property. A property is any website, app, or device you want to track. An account is how you track one or more of these properties. Liz has a personal account that only she has access to, and uses it to manage three different websites (or properties). If Liz grants other users with account-level access, they will also have full access to all three properties. 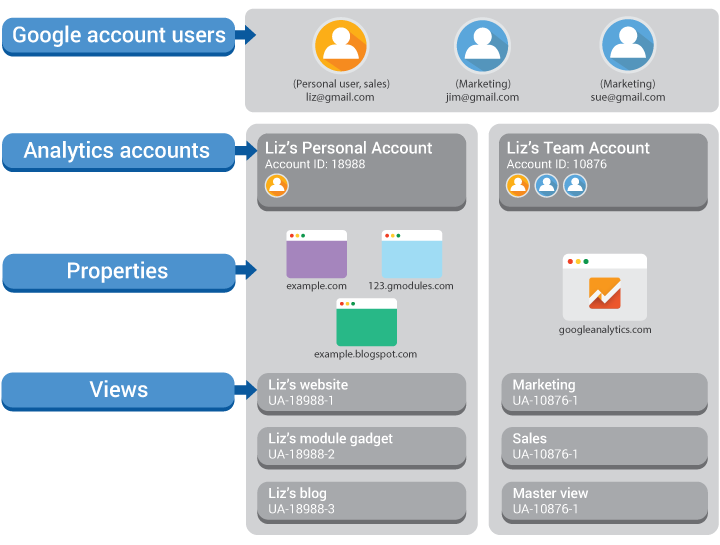 In the case of the second account, the team account, three users all have full access to the googleanalytics.com property. Liz can also add users on a property-level basis, which will give them access only to that specific property. There are many ways in which you can configure these accounts, but keep in mind that the maximum number of properties per account is 50. For Website Name, enter the name of the website. Under Website URL, click on the dropdown menu and select the correct protocol, then enter the website URL in the field next to it. The boxes are checked by default. You can read more about each option on Google’s support page and deselect the options you don’t want. When you’re finished, click “Get Tracking ID” at the bottom. That’s it! You now have a Google Analytics account. In order to actually start collecting data, you need to insert the tracking code onto your website. If you have a WordPress site, you can use a plugin to do this. In addition to the website you’ve just created, you can set up a new property. Properties can be websites, mobile apps or devices (i.e. point-of-sales) and you can have up to 50 properties per account. Views are different ways to view your data. An unfiltered view is automatically created for each property, but you can create additional views and apply filters to them. For example, you can create a view that excludes internal traffic or filter data by location. You can have up to 25 views for each property. While you might be able to gather insights from raw data, custom events and goals make it easier to track key performance indicators.